Jimmy Kimmel Live! is known for practical joke-based segments, and for Father’s Day, the late night host challenged families to surprise dads in the shower with breakfast cuisine. That’s right, families everywhere concocted breakfast meals complete with the likes of eggs, juice, bagels and, in one case, pancakes, in order to dump them all on dad while he was enjoying his shower. Check out the hysterical video, below. This may be a weird thing to take from a video that is essentially about food throwing, but what I like best about “I Served My Dad Breakfast in the Shower” is the way that it highlights how all families are different. Not only are some of the kids (and teens) a little more vicious than others when dumping foods on their respective dads, the dads also react in totally different and unique ways when they get their breakfasts in the shower. Not only are there dads who get angry and swear and dads who don’t seem to be quite awake and aware regarding what is happening to them, but there are dads who joke around about being naked, dads who tease their kids in return and dads who think the whole thing is hilarious. Sure, it’s a little mean-spirited, and a few dads respond in an offended manner, but there’s also quite a few who take the weird photoshoot for Jimmy Kimmel in stride. 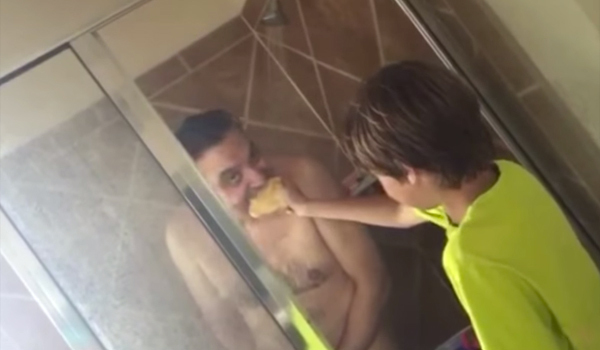 There’s even one dad in particular who patiently takes bites of the breakfast his kid brought him in the shower. Someone needs to get that father a #1 Dad mug, pronto. My personal favorite moment, however, comes when a teenaged kid delivers his dad a full meal in the shower, complete with real plates and cutlery. Unlike some of the video shots, it’s a bad angle and you can’t really see into the shower, but you do hear all of the breakfast cutlery making a sharp crashing noise as it hits the floor. There’s a brief pause and then the dad in the shower calmly tells his son, “Thank you.” What a classic moment. Kimmel’s a big fan of getting viewers to put together home videos like these. For years now, he’s created the “I Told My Kids I ate all Their Halloween Candy” segments, which is in a similar vein to this Father’s Day prank. But Kimmel doesn’t just use his audience for pranks on his show. He’s just as willing to poke fun at himself and has been pranked live on the air before by other celebrities. You can catch Kimmel getting up to more shenanigans on weeknights at 11:35 p.m. ET, only on ABC.